It’s essential to send kids to school with something in their stomachs, even if it’s just a piece of toast. Skipping breakfast can harm children’s developing brains and bodies, making it harder for them to focus in class. Karla Dumas, a dietitian with the Humane Society, says it’s important for kids to get their metabolisms going in the morning even if they’re not hungry. She often prepares smoothies for her 11-­year-­old stepdaughter as a way to get something in her system — she, like most young ones, isn’t hungry enough to eat a full breakfast first thing. Smoothies and other to-­go foods are a good way to get at this problem. Here are five ideas for fast, easy weekday breakfasts. These meals are good for school-­bound kids — and their busy parents, too. We like these for their freezer factor. Make five on Sunday and pop them in the freezer, then reheat each morning and wrap in aluminum foil for a filling to-­go breakfast. 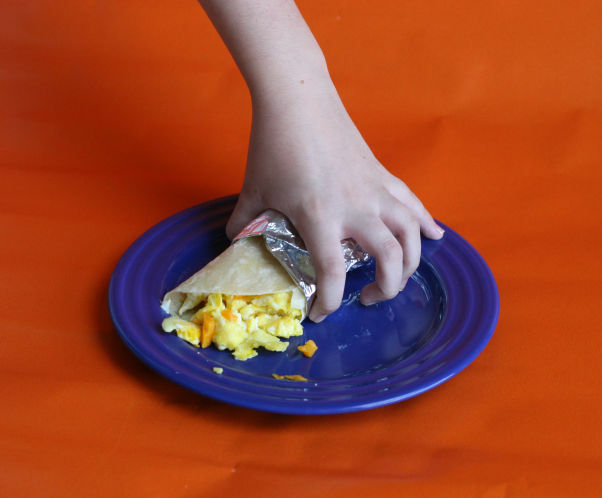 To make five burritos: Crack 8 to 10 eggs into a bowl, add some salt and pepper to taste and whisk well. Cook eggs in a nonstick skillet until scrambled;; turn the burner off just before they’re done so they don’t overcook — remember, these will be reheated. Divide eggs among five flour tortillas. Season with more salt and pepper, then top with shredded cheddar cheese. Roll tortillas to form burritos and freeze in a large zip-­top bag for up to 5 days. The morning of, take a burrito out, wrap it in a wet paper towel and cook it in the microwave for 1 minute. This oatmeal absorbs liquid in the fridge overnight, so all you need to do in the morning is add toppings. To appeal to kids, we’re making those toppings reminiscent of peanut butter and jelly. To make: In a mason jar or other glass container with a lid, mix 1⁄2 cup rolled oats with 1⁄2 cup milk (regular, soy or almond). Stir in 1 tablespoon peanut butter and pop in the fridge;; let sit overnight. In the morning, give the whole thing a good stir, then top with 1 teaspoon jam or jelly and 1 teaspoon diced walnuts or almonds. Smoothies are ideal for people who don’t feel like eating breakfast. To really speed things up, throw all of your smoothie ingredients in a bag in the freezer the night before. In the morning, simply dump the bag in a blender, add liquid and mix. To make: Here’s a recipe for a peach-­strawberry-­banana variety. To a blender, add 1 whole frozen banana, 1⁄3 cup fresh or frozen strawberries, 1⁄3 cup fresh or frozen peaches, 1⁄3 cup yogurt, and a couple of splashes of water or orange juice, then blend until smooth. (Optional: Add a scoop of vanilla protein powder.) You shouldn’t need ice if you’re using frozen fruit;; if you’re not, add 1 cup of ice before blending. We’re topping this toast with all kinds of goodies to make sure it keeps your munchkins full for a few hours. To make: Toast two pieces of whole wheat or whole-­grain bread. Slather each piece with 1 tablespoon peanut butter, then top with banana slices. (Use 1 whole banana per two slices.) Add a handful of raisins to each slice, then drizzle the whole thing with some honey. Serve with plenty of napkins.